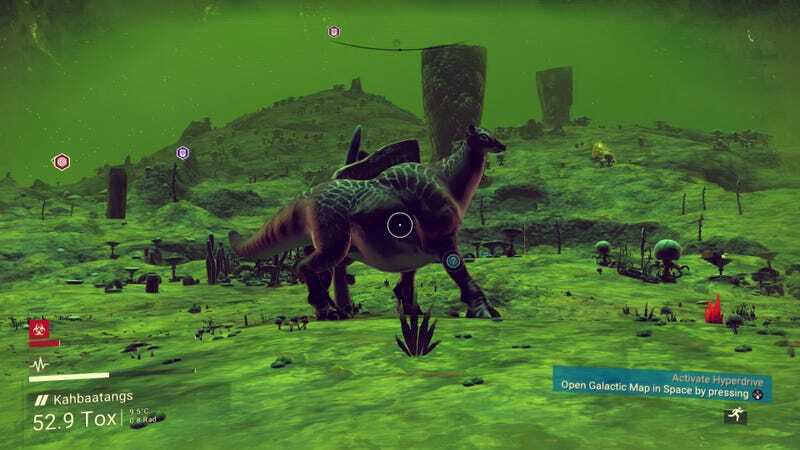 The planets in No Man’s Sky are so vast, that one player has spent 30 hours adventuring on his starter planet. It’s amazing. Discovered by 27-year-old gamer Jorgen Fernandez, Kahbaatangs is a mostly barren desert with a 24 hour rain cycle. “The worst thing about my planet was the lifelessness and lack of diversity a desert planet inherently has,” Fernandez said. Frankly, it’s the sort of planet that most players would run away from as soon as they could, but Fernandez took it as a challenge anyway. Kahbaatangs technically has a day/night cycle, but mostly, it’s just varying intensities of green depending on the time. Specifically, Fernandez explored his initial planet so thoroughly because he felt motivated to beat No Man’s Sky’s cumbersome and annoying inventory limits right from the start of the game, before exploring the rest of the galaxy. “It all started when I looted a couple of trade commodities and was quickly running out of inventory slots,” Fernandez explained. “Strapped for slots, I finally found a vendor I could offload all my stuff. Then after taking off I found a drop pod not too far from the vendor. Curiously, I inspected it and found that I could buy more exo suit slots (and could afford it). In a woe that must be familiar to many ambitious No Man’s Sky players, Fernandez is still searching for that one last life form to complete his planetary records for Kahbaatangs. It’s absurd to think one could spend dozens of hours on a single planet, but this far in, Kahbaatangs still finds small ways to surprise Fernandez. Beyond maxing out all of his slots, the hours Fernandez has spent in Kahbaatangs have paid off linguistically, too. “I’m 100% fluent in Gek,” Fernandez boasts. Eventually, Fernandez will leave his starter planet—but he doesn’t plan on surveying other locales as closely as he did Kahbaatangs. Instead, Fernandez wants to just enjoy gathering resources and seeing what else No Man’s Sky has to offer.